The Buffalo Bills Foundation is proud to announce that Stanley Rola has won the 50-50 raffle for the Bills-Dolphins game. The jackpot was $71,486, with a winning ticket for $35,743. Rola bought a ticket with his friend Stan Brese, who he has attended games with for over 15 years. The two plan to spend the money on vacations. The Buffalo Bills Foundation is proud to announce that Cameron McClelland from Daytona, Florida, has won the 50-50 raffle from the Bills-Colts game. The jackpot was $44,070, with a winning ticket for $22,035. The Buffalo Bills Foundation is proud to announce that Jason LeMay from New Hampshire, has won the 50-50 raffle from the Bills-Patriots game. The jackpot was $110,289, with a winning ticket for $55,145. Though LeMay buys 50-50 raffle tickets at each sporting event he attends, he was in complete disbelief that he actually won. “I couldn’t believe it,” stated LeMay. LeMay plans to use the money to buy his wife a new car. The Buffalo Bills Foundation is proud to announce that Cole Barrish from Wheatfield, has won the 50/50 raffle for the Bills-Saints game. The jackpot was $113,788, with a winning ticket for $56,894. Aside from enjoying a nice birthday dinner, Barrish has no set plans for the funds. The Buffalo Bills Foundation is seeking volunteers to sell 50/50 Raffle tickets at each 2017 Buffalo Bills home game. Volunteers arrive early and sell raffle tickets pregame until the end of the 3rd quarter, when the winner is drawn. Please note: Volunteers for the 50-50 Raffle must be 18 years of age or older. The Buffalo Bills Foundation is proud to announce that Kelly Hanzlian has won the 50-50 raffle for the Bills-Buccaneers game. The jackpot was $130, 369 with a winning ticket for $65, 185. The Buffalo Bills Foundation is seeking volunteers to sell 50/50 raffle tickets at each 2017 Buffalo Bills home game. Volunteers arrive early and sell raffle tickets pregame until the end of the 3rd quarter, when the winner is drawn. Please note: Volunteers for the 50-50 raffle must be 18 years or older. The Buffalo Bills Foundation is proud to announce that Chris Lodboa from Niagara Falls, Canada, has won the 50-50 raffle for the Bills-Broncos game. The jackpot was $118,050, with a winning ticket for $59,025. 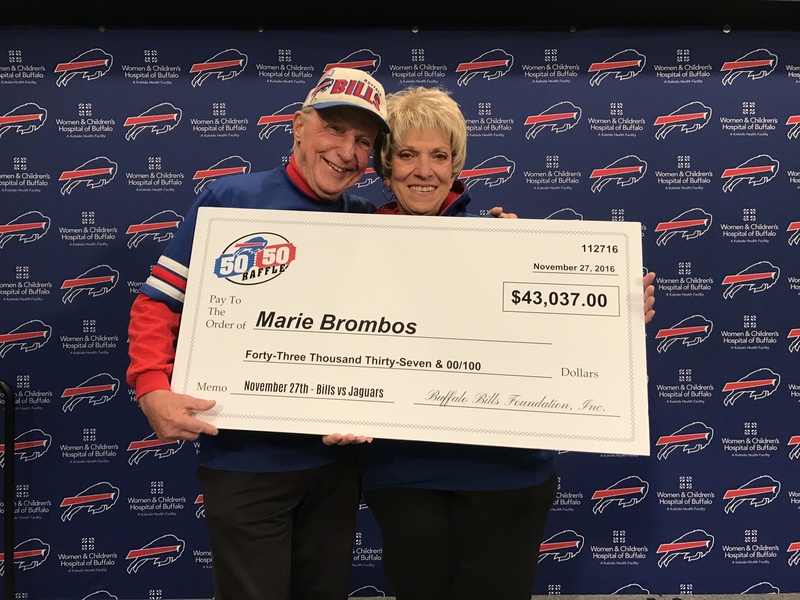 Lodboa buys 50-50 raffle tickets at every sport event his attends, Bills games being no exception. When he realized that he had finally won, he had to double check with the friend he attended the game with just to make sure he wasn’t imagining it. “It was shocking, and a little surreal at times too, “stated Lodboa. The Buffalo Bills Foundation is proud to announce that Robin Warney from Utica, New York, has won the 50-50 raffle for the Bills-Lions game. The jackpot was $22,974, with a winning ticket for $11,487. As a loyal Bills fan, Warney routinely buys 50-50 raffle tickets when he attends games. “It felt surreal [to have finally won],” stated Warney. Warney plans to use the money to go to more Bills games this season. The Buffalo Bills Foundation is seeking volunteers to sell 50/50 Raffle tickets at each 2017 Buffalo Bills home game. Volunteers arrive early and sell raffle tickets pregame until the end of the 3rd quarter, when the winner is drawn. Please note: Volunteers for the 50/50 Raffle must be 18 years of age or older. 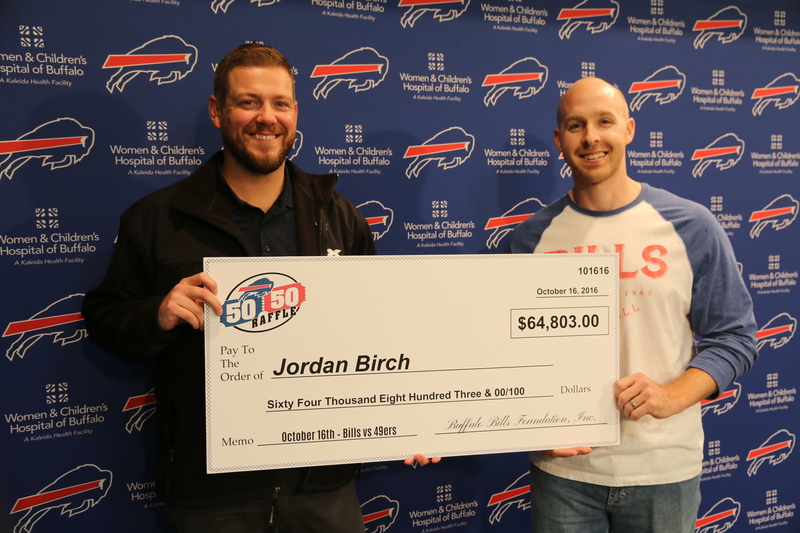 The Buffalo Bills Foundation is proud to announce that Jordan Birch, of Waterloo, Ontario, has won the 50-50 raffle for the Bills-49ersgame. 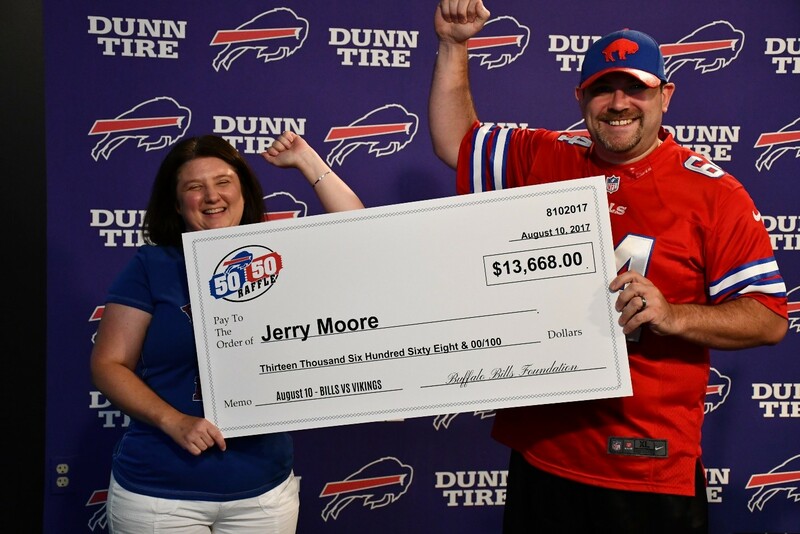 The jackpot, a Buffalo Bills Foundation 50-50 record, was $129,605, with a winning ticket for $64,803! 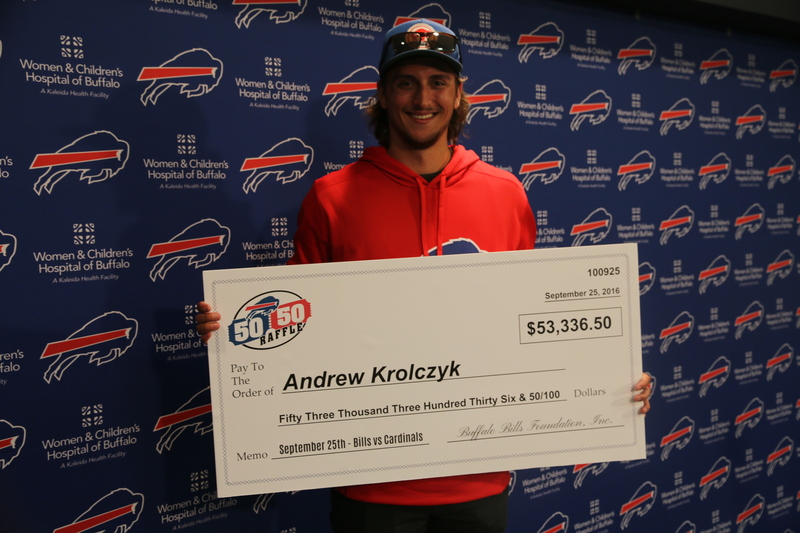 The Buffalo Bills Foundation is proud to announce that Andrew Krolczyk, of Central New York, has won the 50-50 raffle for the Bills-Cardinals game! Krolczyk attended Buffalo’s Week 3 matchup with his father, who is a valued Buffalo Bills Season Ticket Member. The jackpot was $106,673, with a winning ticket for $53,336.50.